Some months ago a friend asked me, in response to a conversation about hiding vegetables in chocolate cakes (namely my chocolate courgette cake), if I’d ever tried black bean brownies. I’d never even heard of such a thing and immediately had to investigate. I found a recipe for a vegan chocolate black bean brownie which seemed appealing on first inspection. I bookmarked it, picked up a couple of tins of organic black beans at my local whole foods shop and promptly forgot about them and the recipe. This winter in Shetland has been terrible. I’ve only been here for 15 years, but it’s been said that this is the worst windy winter seen for twenty years what with the relentless southeasterly gales and travel disruptions. As a family we’ve been spending a lot of time indoors and we haven’t made very many trips into town for provisions, mostly because the supermarket shelves have been remarkably empty with the lifeline ferry cancellations (Photo Shetnews link!). I’ve lived on this remote island in the North Sea long enough to prepare for such weather conditions, and every Autumn I stock up on tinned and dried foods like black eyed beans (see how to cook black eyed beans) and I fill up the deep freezer with a local Shetland lamb or two, just in case. We’re working our way through these store cupboard provisions now which is why I rediscovered the tins of black beans I bought a few months ago. After taking a blogging break to get married I’ve now got the baking bug back again and thought I’d kick start things with something involving chocolate. I went back to the bookmarked recipe and decided to de-veganize it (I had some lovely local organic free-range eggs in my fridge and I don’t really care for flax ‘eggs’). I followed the blogging trail back to the recipe source noting some of the changes other bloggers had made, namely the use of coconut oil (I had coconut oil in my cupboard needing to be used up thereby saving my precious butter for other uses! ), the increased quantity of cocoa (more chocolate is always better, I think!) and the use of a raising agent to give the bake a little lift. I realise that brownie purists will be cringing just now as a traditional brownie typically doesn’t contain a raising agent, but I’m firmly in the dense, crumbly cakey brownie camp as opposed to the dense, chewy, molten centre camp, hence my preference for a little baking powder (my rationale being that the Cadbury Bourneville cocoa I had available is, according to the interwebs, Dutch-processed, otherwise baking soda would have been required!). These brownies have an intense chocolate flavour, a very pleasant cake-y texture despite being flourless and there is not even one hint of a taste of black beans in them. There’s enough cocoa to disguise it well. 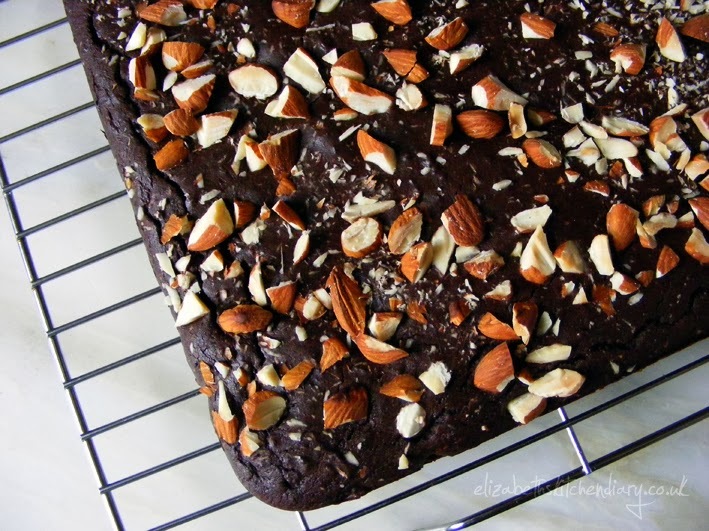 I reckon you could even omit the almonds (or stir them into the batter instead of sprinkling on top) and frost them with an avocado chocolate frosting for some extra secret healthy awesomeness. Both black beans and almonds are considered heart-friendly foods with their wide range of nutrients and abilities to help reduce LDL cholesterol (the ‘bad’ cholesterol) so I reckon these sweet treats would make an ideal Valentine’s Day treat for a loved one. What better way to say ‘I love you’ than with a home bake which helps maintain heart health? 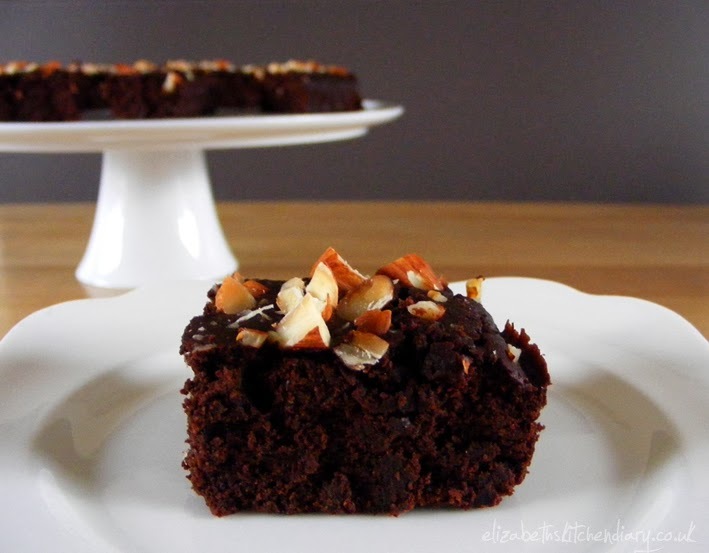 Intensely chocolatey, gluten & dairy free brownies with a healthy twist! 1. Preheat oven to 180 C and lightly grease an 8 inch square baking tin. 2. Place first 9 ingredients in a food processor and blitz until well combined. 3. Spoon into the prepared tin and sprinkle the almonds over the top. 4. Bake for 30 minutes, or until the brownies start to come away from the edge of the pan. 5. Allow brownies to cool in the pan for half an hour before transferring to a wire rack to cool completely. 6. Cut into 16 squares and store in an airtight container. Brownie flavour improves the following day. An interesting twist, I can see how the flavours would go together well, Good thinking. This sounds so unusual yet so yummy!! I might ask my sister to try as I’m not the best at baking!! Beth l recently posted…We Have A Walker! I’m super intrigued by these gorgeous looking Black Bean Brownies – I’m now wondering if any other bean could be used hmmm….. 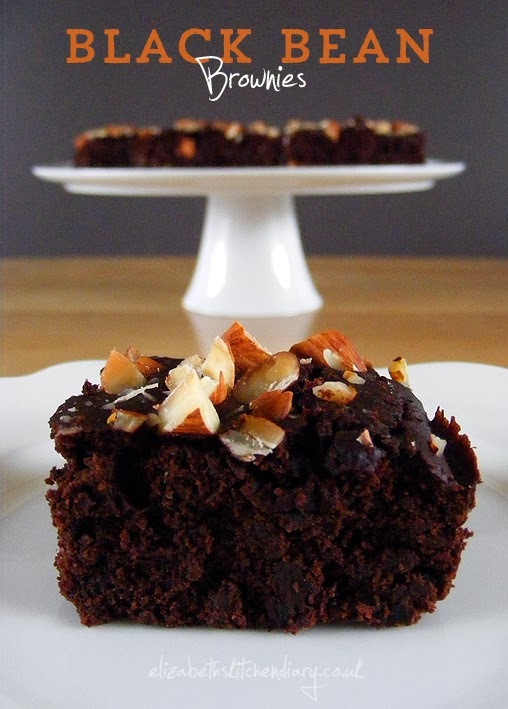 I have tried Beetroot Brownies only recently and these Blackbean ones have me very intrigued!! Thank you for sharing them! I will be bookmarking these for another date. Hopefully sooner then later!! Fabulous idea and it looks amazing, thanks for linking up to Tea Time Treats! I’ve never heard of black beans before and certainly not for brownie making. I’m always amazed what you can find in Shetland that I have to go on a hunt for round here! Thanks for linking up with this month’s ‘Baking with passion’ for Love Cake. OMG so brilliant using beans in brownies.A super healthy treat.Thankyou for sending it to lets cook sweet treats for valentine. Unusual and delicious looking Elizabeth, thanks for entering Treat Petite! Thanks Stuart 🙂 I really do enjoy experimenting with unusual ingredients! Love this idea, a fantastic healthy alternative! It’s a great idea and definitely a great way to sneak extra veg into the children. I love traditional brownies so much though so I’m worried I’d end up being a bit disappointed! I’d have to pretend they weren’t brownies, just black bean cakes and then I could be pleasantly surprised. For this very reason I debated changing the name from brownie to traybake, but I stuck with brownie since I like cake-y brownies 🙂 I’m so surprised my children loved them as much as they did. They will definitely be a regular homebake in our house! I wonder if it matters much what kind of beans you use. I have some leftover Great Northern Beans from a bag I cooked up…. such an interesting idea… I’ve cooked with many a vegetable but never a black bean. I must give these a go, they really look beautiful!